How retailers need to redefine success, and a game to help. With a quarter of US malls predicted to close by 2022, many retailers are wondering how they can survive the approaching apocalypse occurring in the commercial world. While the value proposition of retail destinations has become obsolete, physical shopping is far from dead. In fact, behind the doom-laden headlines and against all odds, stores are continuing to open, innovate and succeed. In the US, retailers announced more than 3,000 store openings in the first three quarters of 2017, and between 2014 and 2018, surveys showed that the percentage of consumers shopping at brick-and-mortar stores weekly increased from 36 to 44 per cent. But in order to continue evolving, physical stores must embrace technologies that have helped their online counterparts succeed. At present, many retailers only think of a physical store as hardware – the architecture, the layout, the products within – but it's crucial that they combine this with an invisible layer of technology: the software. The biggest mistake most traditional retailers make is treating e-commerce as a separate channel, in turn creating siloed experiences. As they break down these silos, retailers need to rectify the metrics they use for defining a store’s success. Metrics such as sales per square foot and year-on-year sales are from a pre-Amazon era. In the future, measures such as impact on brand impression, digital purchase intent, inspiration per square foot, return on friction, convenience for associates and customer experience will play a much more crucial role. 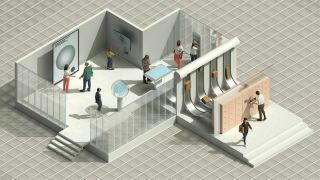 The Future Laboratory believes that future stores will not simply be experiential hubs without products, nor will they be screen-filled fulfilment centres. They will be the best of both worlds and catalyse a relationship with the consumer that transcends the store. To accompany The Future Laboratory's recent Storefront Salvation report, we created a free game to put the public in the shoes of future brand managers, so they can experience what decisions need to be made to help stores survive the so-called retail apocalypse. Have a go now. Will you go bust, break even or break the bank? After you’ve played, share your score @TheFutureLab on Twitter. Good luck! This article originally appeared in issue 284 of Computer Arts, the world's leading graphic design magazine. Buy issue 284 or subscribe here.